⬅ Make Your Own Fireworks This July 4th! We recently celebrated our twenty-eighth wedding anniversary! It’s hard to believe that we met and started dating thirty-four years ago. We have done a lot of life together! Unlike most of our blogs, this one is a glimpse into our personal life and the celebration of our twenty-eighty wedding anniversary. We hope by sharing you will be inspired to create your own unique and fun wedding anniversary. Each wedding anniversary is different. Some years we were very connected and things were strong between us. Other years we were so busy with careers and raising kids that we were not very deeply connected. Some wedding anniversaries fell on dates when one or both of us were between jobs. Other wedding anniversaries happened amidst medical issues for ourselves or one of our family members. Sometimes our wedding anniversary fell around the time we were grieving the passing of a loved one. We have always done our best to protect our wedding anniversary date so that we could be available to each other. A few wedding anniversaries we were unable to be together face-to-face. So we had to plan another date in the calendar to celebrate our anniversary. This year we were both out of town in different locations for our twenty-eighth wedding anniversary. Devra was in Lubbock celebrating the graduation of one of our closest friend’s daughters from Texas Tech. Roy was on Lake Geneva north of Chicago leading a men’s Crucible Weekend. So we had to plan another date to celebrate. We had never been to New Orleans. Devra’s birthday was around the corner and she had a desire to celebrate our wedding anniversary and her birthday with a trip to the Crescent City. We were looking forward to touring historic buildings and plantations. When we were packing, we decided to dress comfortably except for one meal. We found that we had the same t-shirt for every day of our trip. So when one of us was separated from the other, we just asked people around us if they had seen someone in that same shirt. It worked! We flew into New Orleans on Southwest Airlines. It just so happened that we had enough Rapid Reward Member points to make this travel free! We picked up our rental car. For the first time ever, we booked our lodging through AirBnB. There are hundreds of options in New Orleans. We picked on of the gated huge old homes near the French Quarter. We had a private entrance to a fully furnished apartment that also had a shared pool. It was great to have a full size fridge and functioning kitchen, living room, bed room, etc. Some friends told us we must eat at New Orleans historic Mother’s Restaurant. It was a cool old café kitchen. We shared a sampler plate with five of New Orleans signature recipes. We headed over to tour the Cathedral-Basilica of Saint Louis King of France. This magnificent old church has beautiful artwork throughout depicting Jesus and his family and the apostles and some saints. We are not Catholic, but we enjoyed the beauty of faith expression. We headed to the historic French Market and enjoyed shopping through all the vendors. Marvelous artwork and some real finds on tourist souvenirs. We stopped by beignets at legendary Café Du Monde and had our very first café au laits laced with chicory. That late afternoon we spent a couple of hours at Ticklers Dueling Piano Bar. We are not “hang out at the bar” people, but we had fun singing along and sometimes dancing to live music in this fun atmosphere. Devra had found the New Orleans Power Pass and purchased them online. They are so much cheaper than paying entrance fees at everything. Well worth the money. Everything we did was on the power pass. We picked them up first thing. Friday was Devra’s birthday so Roy got up early and found take out at IHOP and brought it back. When Devra woke up, she found dozens of balloons and happy birthday posters all over the place. Breakfast was warm and on the table. It was a good way to begin the day celebrating. We enjoyed lunch at the Ruby Slipper. Incredible food! We made our way to the Ultimate Swamp Adventures and a tour down a bayou led by a Cajun boat captain who was spinning tall tales. We watched alligators in their natural habitat. Of course the boat sang Happy Birthday to Devra! Our next stop was at the National World War II Museum. It is hands down the best museum we have ever seen. If you go to New Orleans, you must make this tour a priority. Shared a plate of seafood at Oceana Grill. Yeah, we know… but it was so yummy. That evening we stopped by the New Orleans Museum of Art as they were closing, hoping to get in. Just our luck, they were having a special event and invited us in. We enjoyed walking through three stories of art while an ensemble played chamber music. It was like we were the only ones there and we enjoyed a little dancing amidst the incredible art and sculpture collection. We took a walk through 300 year old live oaks at City Park and ended the night with live music at Morning Call. We enjoyed live Frank Sinatra tunes by a musician who also sang Happy Birthday to Devra in three languages. We hopped on the Creole Queen River Paddle Boat Cruise and enjoyed a history lesson as we traveled down the Mississippi River. Our one stop on the cruise was Chalmette Battlefield. We learned that General Jackson led regiments of Free Black, Creole, Native American, Acadian, Mexican, and European Americans to defeat the British who were making an attempt to take what would become the American Midwest. Great tour. We stopped by the expansive Audobon Aquarium of Americas. One of the benefits of the Power Pass is that you get to pass by all of the ticket lines and head straight for the entrance of each attraction! We made out way out to tour the River Road Plantations. We stopped into the historic Oak Alley Plantation. One of the most picturesque entrances to any home we have ever seen. We also toured the San Francisco Plantation. We were touched by the plight of slavery. What a dark mark on the history of America. 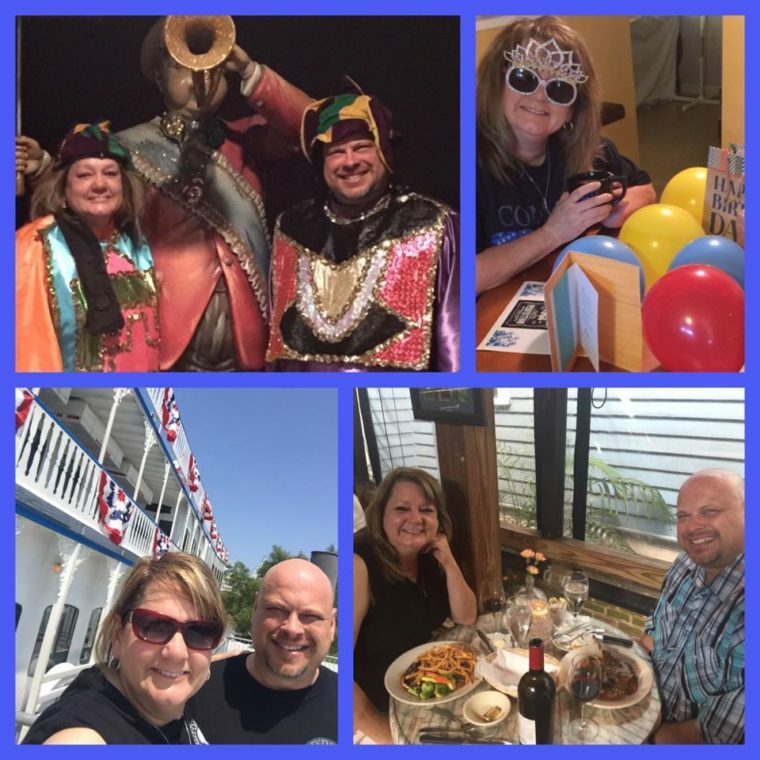 We celebrated our anniversary that evening at the legendary Café Degas then took the New Orleans Street Car down historic St. Charles Ave. and looked at incredibly old homes. We enjoyed sleeping in and had a devotional time of worship alone together over breakfast at our Esplanade Ridge lodging. We shopped around the French Quarter and watched street vendors. We enjoyed cajun seafood at the Corner Oyster House and then hopped on the New Orleans City Tour. Great almost four hour historic tour of New Orleans, including the historic Hurricane Katrina disaster. Learned about “neutral ground”. We enjoyed a lazy morning and then headed out to the Church Alley Coffee Bar, voted the best non-franchise coffee spot in New Orleans. Delicious breakfast and coffee. Toured the Southern Food and Beverage Museum. This one was the least of our favorites, but we found gems amidst the disorganized displays. Enjoyed authentic Creole items at the place where General Andrew Jackson met with the infamous Jean Lafitte, The Original Pierre Maspero’s. Had a great time at the New Orleans School of Cooking with Chef Kevin Belton (author and PBS cook show host). Fun time learning how to cook jumbalaya, gumbo, and pralines. In case you wondered, pralines are sugar, butter and whatever nuts you want to put in. Yummy but so bad for you! Next we made our way to Mardis Gras World. We heard about history while walking through the floats. We dressed up in their costumes and took pictures. They actually build the floats there, as well as items for Disney, NFL and others. We made our way back to the airport and said goodbye to New Orleans. If you are looking for a place to stay, check out AirBnB options. You can use this link and get $30 off your first stay. Parking can be expensive. We parked for free and used Uber to get around. If you click this link, your first Uber ride is free. Focus on your spouse’s desires and plan the trip that we will most memorable for them. Make room to tolerate their favorites and enthusiastically participate. Your spouse will be more likely to return the favor when you ask for them to do the same for your favorite thing. Trips in nature can be just as fun and relaxing as urban trips, so don’t forget about a trip to the beach, mountain, island, lake or river. Have a budget and stick to it. Find the free stuff. Use coupons. Ask the locals. We visited with several Katrina survivors who now live in Houston who made recommendations for us before we left. When in New Orleans, we asked the locals about their dining recommendations.